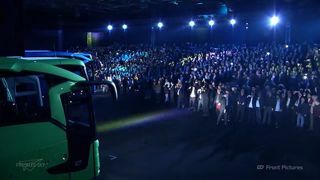 Datapath technology proved central to a creative, multimedia launch event for the Mercedes-Benz Travego at the company’s Turkish dealership in Istanbul. Two Datapath x4 display controllers were deployed in the set-up by regional system integrator, Front Pictures Studio, in order to output signals to a large number of projectors from a single server. Having seen the stunning effects produced by Front Pictures’ collaboration with digital entertainment specialists Freckled Sky for the ‘America’s Got Talent’ television series, Mercedes-Benz harnessed this creative partnership for the launch event of its new generation Travego bus. Mercedes-Benz Türkiye wanted a top-notch creative multimedia performance complete with projection mapping in order to create a highly memorable and spectacular show for the event’s VIP guests. The system configuration included Front Pictures’ Screenberry media server (synchronised with the overhead stage lights), two Datapath x4 display controllers, eight projectors and a seamless projection scrim measuring 48 x 8m. The total output resolution was 5400 x 900. The Datapath x4 is a stand-alone multi-display adapter and video wall controller that accepts a standard single or dual-link DVI video signal up to 4k x 4k resolution at 30 fps. It provides four display outputs for almost endless creative possibilities, while all outputs can be genlocked to process footage seamlessly. Mercedes-Benz was extremely happy with the end result. Indeed, the show received a standing ovation at its conclusion. Although Front Pictures is an established user of Datapath x4 controllers, the company already has its eye on the new Datapath Fx4. Front Pictures not only uses Datapath display controllers but also capture cards in the company’s VisionDVI-DL and VisionSC-DP2 series to provide smooth integration with external video devices. “Moving forward, we will definitely continue using Datapath hardware to provide our clients with even more extreme and reliable media solutions,” concludes Irina.